Texas drivers will soon be able to enjoy a more streamlined process when it comes to registering and inspecting their vehicles. This will result in them needing only one sticker on their windshield. Set to go into effect on March 1, 2015, all Texas registrations and inspections renewed after that date will be affected. As of that date, the state's car inspection sites will no longer issue inspection stickers. The new process will instead give you just one sticker to affix to your windshield. This makes the two events related so that you will not be able to obtain or renew your vehicle's registration without having a valid inspection sticker. While the change might seem confusing, it is actually pretty simple. The only thing that will change is how you receive your vehicle renewal. Getting your vehicle inspected will not change except when it comes to receiving a passing sticker when you are done. Instead of affixing the traditional sticker to your windshield, car shops will give you a receipt. All of your pertinent vehicle information - including the fact that your vehicle has passed inspection - is entered into a database. Once you arrive at DMV to get a new registration, your information will be accessed and a combination registration/inspection sticker issued. It is best if you bring your receipt with you to DMV just in case your information is not already in their system. For example, some car inspection shops are not even aware of the change and might not enter the necessary information in a timely manner or even at all. The process is designed to be more convenient for all those involved. Car inspection shops will no longer have to be concerned about keeping the necessary stickers on hand. 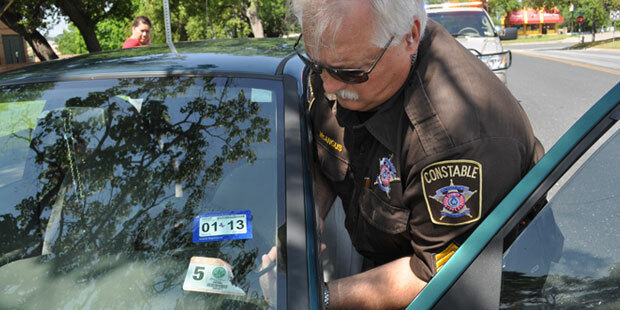 Drivers, too, will find that they can eliminate the need to get two different stickers for their vehicle in what is likely to be two different months every year. Instead, everything is synced to expire at the same time saving drivers’ time. For those drivers who have inspection stickers that expire before the new process goes into effect, simply renew them as you normally would. You will receive the combined sticker next time. Those drivers who must get their cars inspected after March 1, 2015, can do so at any time within 90 days of your registration expiring. The State of Texas Education Agency (TEA) has approved and licensed Texas defensive driving courses which are also known as traffic schools. You can take advantage of them if you want to enjoy a discount on your auto insurance or if you were cited with a moving traffic violation. In some cases, the traffic court in the Texas county where you obtained a traffic ticket will allow the citation to be dismissed which will, in turn, help reduce the likelihood of points being added to your record when you successfully complete a Texas defensive driving course. Many people decide to take a defensive driving course for other reasons. For instance, you will gain crucial knowledge about Texas driving laws, obtain techniques to help you drive defensively and learn how to avoid receiving traffic tickets in the first place when you take a Texas defensive driving course.